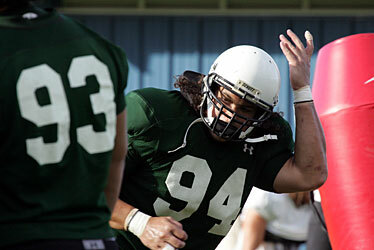 Offseason work has boosted Hawaii defensive end David Veikune's endurance, allowing to play more. David Veikune's engine has always revved pretty high. Now he can keep the needle in the red for extended stretches. On a draining afternoon for the Hawaii defense, Veikune was on the field for 81 of the 86 snaps Oregon State ran Saturday, a figure even he found startling. 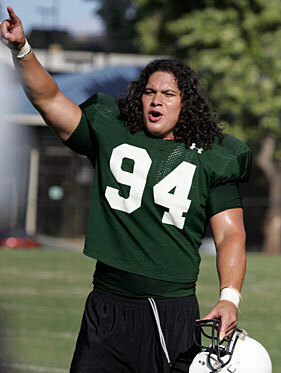 Veikune made some noise at yesterday's practice, much like he did Saturday with 10 tackles in the loss to Oregon State. "It didn't seem like that many plays," Veikune said after the Warriors' practice yesterday morning. "But 81 plays, that's crazy. I never would have thought in my college career I'd be in that many plays." Veikune finished with a career-best 10 stops in Hawaii's 45-7 loss to the Beavers, though he'd trade the individual numbers for another digit in the win column, and the performance drew lofty praise from head coach Greg McMackin for both quality and quantity. "That was one of the best individual efforts I've ever seen from a player, pro or college," said McMackin, who's bounced around at both levels for close to four decades. "He had 81 plays and he didn't take one snap off. ... Last year we (substituted) for him because he went so hard. Now he can go 81 plays full speed and he goes with reckless abandon." Veikune said he'd often expend his energy in three-play bursts last season when he rotated with starting end Amani Purcell. But an offseason devoted to running, lifting and stretching has paid off in maintaining his level of intensity over the course of a game. "I was tired (after the Oregon State game), but it's not as tiring as conditioning over the summer," said Veikune, among the strongest members of the team. "I think I was more dead during those times, so I think the summer really helped. This is the best shape I've been in in my life. "I didn't take a day off (in the summer). Since it was my senior season it really pushed me and the loss to Georgia (in the Sugar Bowl) really pushed a lot of the team to work hard in the offseason." Generally soft-spoken, Veikune's tally last week vaulted him to the top of the Warriors' defensive chart with 20 total tackles, including 12 solo stops and two for loss, after piling up 34 all of last season. "He's not the loudest guy, he's really reserved, but his play is loud," said senior linebacker Solomon Elimimian, who was also in on 10 stops last week. "He makes a lot of tackles, he makes a lot of plays in the backfield, and he's just a great teammate to be around. "He plays hard and plays with emotion and that's something we feed off of and that's something we need." UH is Veikune's third stop since graduating from Campbell High School in 2004. He redshirted at Colorado, then spent a year at Fresno City College before transferring to Manoa as a sophomore. Last season, Veikune led the Warriors with seven sacks - including one against Nevada resulting in UH's lone safety of the season - and was a first-team All-Western Athletic Conference selection, although he came off the bench for most of the season. Along with building his strength and endurance over the summer, Veikune said refining his running technique has also aided in his ability to chase down ball carriers. "Defensive ends now, we're basically like linebackers," the 6-foot-3, 265-pound Veikune said. "Back 10 years ago defensive ends could be those big guys, now it's more speed. "Coach said we're a swarming, attacking defense, so I just play as hard as I can every single play and leave everything on the field."